Cut off the stem of the artichoke at the base. Then cut off about 1-inch of the top. Squeeze lemon juice over the artichoke. Tear off 2 large square pieces of heavy-duty foil. 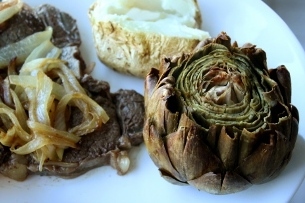 Rub a few drops of olive oil on the foil and then place an artichoke stem side down. Put a clove of garlic into the center and push it down an inch. Drizzle 1 tbsp olive oil and sprinkle salt over the top. Finish by squeezing the the rest of the lemon over the top. Gather up the corners of the foil and press together on top to tightly seal the artichoke. You can wrap in a second piece of foil if you need. Place in a roasting pan and bake at 425 for 1 hour. Let rest for 15 minutes before unwrapping and serving. You can eat this hot, warm, or chilled.